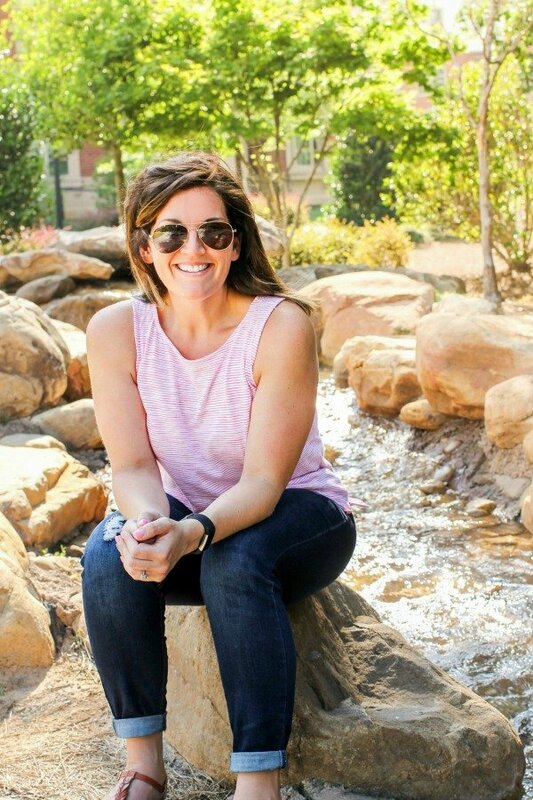 November 30, 2018 By Allyson 4 Comments This post may contain affiliate links. Read my disclosure policy. Holiday Reindeer Cookies are easy no-bake cookies that the whole family will love! They’re fun to make, and perfect for parties and cookie exchanges! Every year we get together with some friends and bake up a storm for Christmas! Well, more like to get in the mood for Christmas. This year, I was determined to use Nutter Butter Cookies, because I seriously LOVE them. I am obsessed with peanut butter anything, so these little delicious brown cookies hold a dear place in my heart. I also wanted to just put a spin on this already perfect cookie, because I hate making a big baking mess…trust me, I am not a baker. I was excited to make these Holiday Reindeer Cookies – mostly because they aren’t identical to all the reindeer cookie faces you see on Pinterest, but I think they are rather unique and fun. After you get all of the supplies, setup an assembly line (this will make it much easier). Lay out a large sheet of parchment paper; this is where the cookies will go after dipped in chocolate. Dip peanut butter cookie into the melted chocolate and place onto the parchment paper. 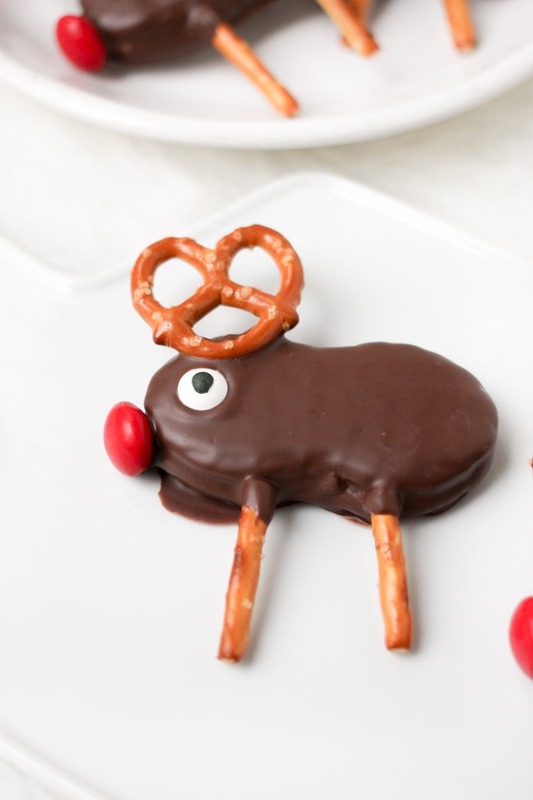 Then, dip the bottom of a pretzel into the chocolate and stick on the top of the reindeer cookie as the antlers. Next, dip the tips of the pretzels sticks into the chocolate and stick those against the ‘body’. Then, put a tiny bit of chocolate on the red candy and place it on the nose. Finally, set the eye candy on the top of the head to complete the reindeer cookies. Repeat for all cookies. When you put the antler pretzels on the top, they will not stay in position until dry. You need to prop something under the pretzel to hold it up. In this case, I just used a row of non chocolate coated Nutter Butter cookies because they were the perfect height. In about 20 minutes when the chocolate is set, you can remove and voila – they are hardened and staying in place on their own. Also, don’t worry too much about the legs, as long as the melted chocolate is touching the melted chocolate on the body, it will dry together. It will seem wobbly and not great while wet, but once it sets it will be perfect. What special items do you need to make Reindeer Cookies? Peanut butter cookie (like Nutter Butters) for the reindeer cookies body. Holiday Reindeer Cookies are easy no-bake cookies that the whole family will love! They're fun to make, and perfect for parties and cookie exchanges! Add crisco to the bowl of melted chocolate and stir until well combined; set aside. Working one cookie at a time, dip a cookie into the melted chocolate (I just used a fork and tapped excess chocolate before placing on paper) and place onto the parchment paper. 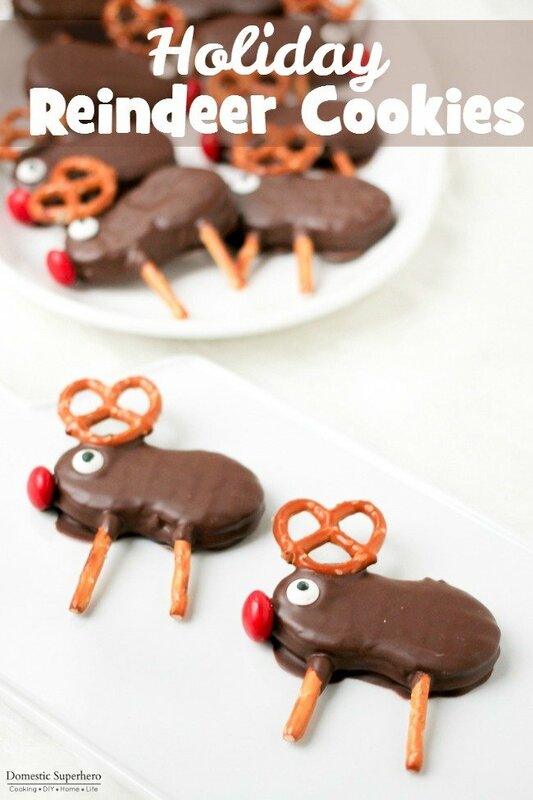 Dip the bottom of the mini pretzel in chocolate and stick on the top as the antlers. Dip the tips of the straight pretzels into the chocolate and stick those against the ‘body’. Dab a tiny bit of chocolate on the red candy and place it on the nose. Set the eye candy on the top of the head (you shouldn't have to add chocolate for this step). Allow at least 30 minutes to dry, but the longer the better. 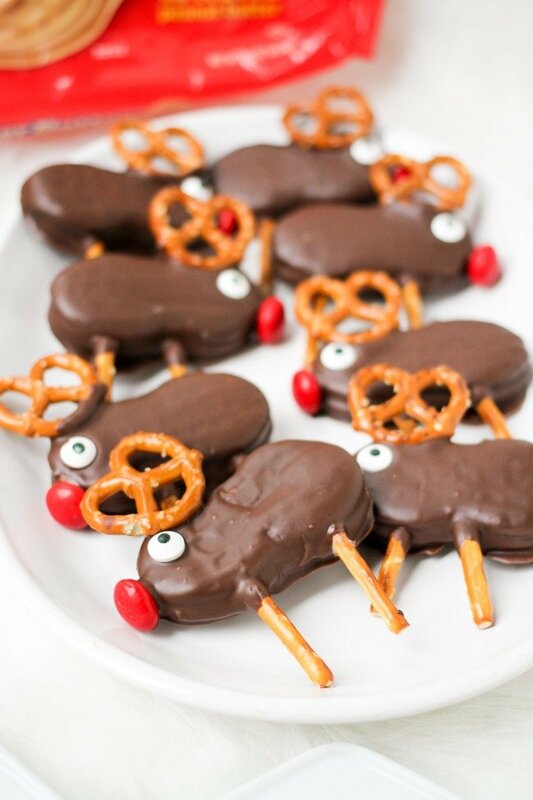 Just a tip, when you put the antler pretzels on the top, they will not stay in position until dry. You need to prop something under the pretzel to hold it up. In this case, I just used a row of non chocolate coated Nutter Butter cookies because they were the perfect height. In about 20 minutes when the chocolate is set, you can remove and voila – they are hardened and staying in place on their own.